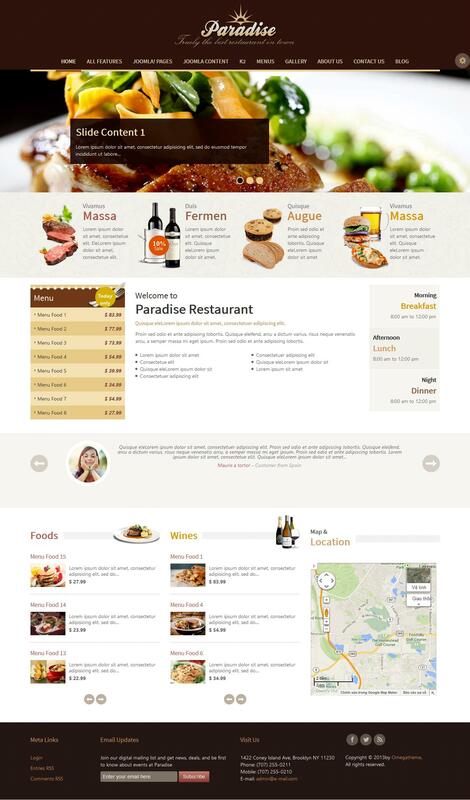 OT Paradise - beautiful layout for the site theme restaurant running on Joomla 2.5x embodied studio OmegaTheme. The distinctive features of this template is a nice design, maintaining several schemes with different color schemes that can be easily configured using built-manager. Content management is performed with the manager of K2. Layout designed platform studio OMG Responsive, develops high-quality templates for their only advanced technology. Template OT Paradise remarkably optimized consistently displayed in any browser and on all mobile devices. This template allows you to create professional websites restaurant, pizzeria or cafe.